Fun and unusual green and white boutonniere with wire wrap with airplanes, hypericum berries and pods. Featured in Ceremony magazine. We are thrilled to be featured today on Wedding Channel’s “Wedding of the day”. Thank you Vero Suh photography, Wow Preety Jira and Hakone Estates and gardens in Saratoga and of course to my sweet couple Jodie and Blair, loved working with you and being part of your day. My dear couple Anjalee and Justin was featured in Ceremony magazine this year. Anjalee and Justin did not want the traditional colorful flowers you usually see in Indian weddings. Their style was more soft and romantic with a rustic flair, perfect for the Mountain Winery where the ceremony and reception took place. Gorgeous photos by Rhee Bevere photography, I can see the love shining thru her photos. Thank you to all of you that was part of this beautiful wedding. Please check out the video from Andy Hirsch and Blue Moon productions. We did a bridal photo shoot last summer at Villa Montalvo for Ceremony magazine and we also got featured in the Bride Chic blog:) Photos by Joy Strotz and flowers by me and my dear friend Shawna from Flowerdivas. 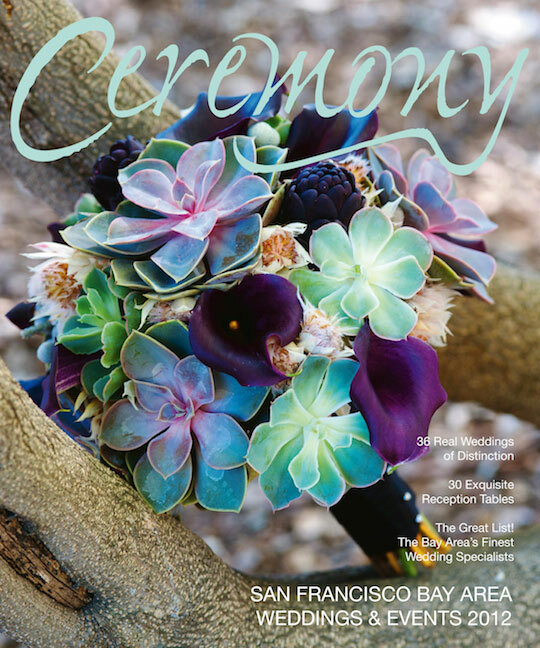 Ingela Floral Design on the Cover of Ceremony Magazine! Ceremony Blog calls ingela’s floral designs Floral Architecture.Click the picture to see the entire post. ingela’s beautiful floral design is featured in this photo shoot by Jill Johnson at Villa Montalvo for Ceremony Blog. To see all the images, click the picture.